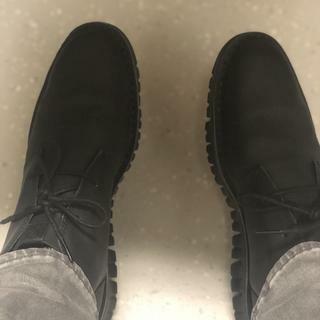 Most comfortable Chukkas I own. I was looking for a pair of boots to wear with jeans which were comfortable to walk around. Could be happy with them. Very nicely priced and great fit. Great shoes if your walking and standing for a long period of time. I recommend this shoes to everyone. One of the most comfortable shoes I’ve ever had. Great shoes, as a big guy finding a true and comfortable true fit shoes I can stand in make life easy. I love this book; I will definitely buy another pair soon. Great shoes and great customer service. Very happy with my purchase, the fit is excellent. They are great I would recommend this boot you will fall in love with them. Outstanding comfort right out of the box. Lightweight and zero break in required. Fit consistent with other Cole Haan shoes. Matte finish looks great with jeans. Love these shoes. Great in rainy weather. Super comfortable and soft. Had to buy a 1/2 size larger and then added an insole. Perect! I would definitely recommend this product. I purchased these boots for my husband, who has knee and feet trouble. He loved them. He said they were the most comfortable boots he had ever worn. We have purchased the “Zero Grande” shoes in various colors also. These shoes are not what I expected. I thought they would be any time and any where shoes. The shoes are of good quality soft leather and are very stylish. I wouldn't want to wear them in bad weather or in a snowy situation. They would be great to wear when going out in a formal or in an informal situation. These shoes feel like you're walking on air! They are very light and great for people who are on their feet all day. These shoes look great too. You can either wear these with jeans/slacks or even a suit. The matte black color looks great! Perfect comfortable everyday wear. They Look like dress shoes and act like sport shoes. Upon opening the box the shoes are WOW.. i put them on and was taken aback by how "flimsy" the ankle support was.. VERY thin leather and feels like you can rip it in half.. Overall this is not a negative to me, but if you are wanting a stiff shoe, these are not for you. I need some grown up shoes for work - these are cool and look comfortable! Great looking shoe. I have a pair in brown and want to change them up day to day. I expect to have these for at least 3 years or so. Good purchase. Bought a pair of Chukkas 3 years ago and they are still greatttttt. it seems to be a very light boot. I needed a black shoe that's comfortable and good looking. Something I can wear with a dress down pair of jeans or a business casual slacks/chinos. It was on sale. I bought the same before Christmas for $189.95. No reason to keep those when I can get them for $114. I've purchased ZEROGRAND styles before and it's the most comfortable shoe I have ever worn. Like the style. Wide width ! I HAD ONE, LOVE IT VERY LIGHT AND COMFORTABLE. Already have another pair of ZEROGRAND. It's very comfy yet stylish enough. Was just complimented twice past few days while getting through the security check at the airport. Seems to be legit to invest another pair with slightly different color/style while it's on big sale. i love the cole haan shoes.... its my 4th cole haan shoes. The comfort, style, and all, i love it. Great sale nice shoe! We shall see if it works out. I love the style and soles. I love Cole Haan and today I could afford it. Really good price. I have several pairs of ZeroGrand wingtips and have been eyeing these Chukkas for a while. The comfort and fit always keep me coming back! I CHOSE THIS BOOT BECAUSE IT LOOKED VERY SLEEK AND WELL MADE. Water resistant and light as air. Good combo in a half boot. Been looking for this style of Cole Haan Shoes. BEST ANSWER: I don't think so. They are very stylish and good quality soft leather, probably not for wearing in the band weather. Appears to be. I have not had them on while it was raining yet. I bought a similar type. it is waterproof. Is the Zerogrand stitch out chukka true to size? I've read that the zerogrand chukka runs large. BEST ANSWER: I bought these for my boyfriend for Christmas. He says they are true to size. He usually wears a 10 and needed a 10 in these. He did however need to size down in the Zerogrand stitchlite oxford, those run large. I wear a size 10 in Cole Haans. This particular style is slightly roomier compared to my othe Cole Haans. You get a little more space for thicker socks. I probably wouldn’t go with a 9.5. I have this style and the brown and they both fit the same. They seem to be true to my size. I have bought other boots not Cole Haan that I had to go a half size lower, but not these. It was true to size for me. I didn’t feel it was large. I bought a size 7, in wide. I think it does run a half size large and the width seems narrower than normal. Size 15 is true to size .............. true to my size ! My experience is that it is true to size. Yes, they are and very comfortable. That is true, they do run large. 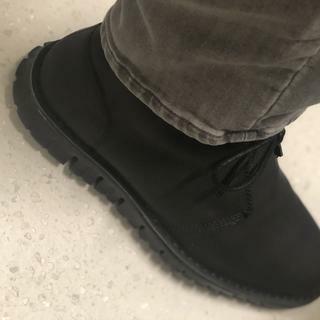 How do you clean the Men's ZERØGRAND Stitch Out Chukka (Matte Black) to maintain the matte black look? 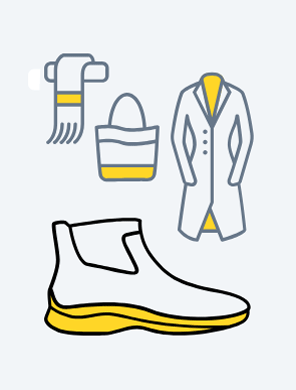 BEST ANSWER: For matte leather footwear, use clear or neutal leather conditioner, rubbing in completeley. You can also use cream polish sparingly applied with a soft cloth. Dab on to cover marks or scratches and blend well. Do not buff. Can/should i put Mink oil on this? BEST ANSWER: As far as I know, these aren't waterproof, so if you're doing it for that reason, you should. What’s the heel height of this shoe? I have been used to wearing the drivers and am used to not having heel height.